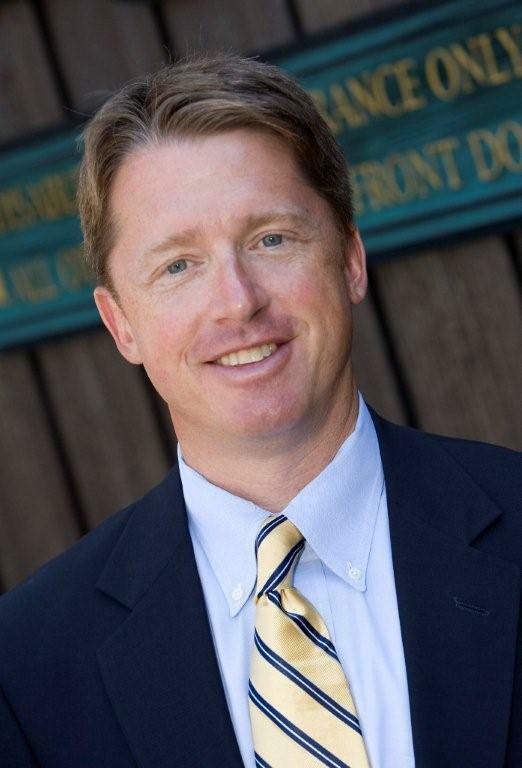 The Journal News, a downstate newspaper that serves Westchester, Rockland, and Putnam counties, recently featured a story about bicycling accidents and deaths downstate, written by David McKay Wilson, a reporter, bicycling advocate and former board member for the Westchester Cycle Club. My hope is this story will help win over hearts and minds downstate about the importance of making our roads safer statewide for bicyclists! Albany, are you listening? It’s time to improve the state’s vague safe passing law! David recently toured accident sites in the Lower Hudson Valley where bicyclists were killed and checked on cases involving motorists facing changes in bicyclists deaths downstate. What he found was the disposition of cases involving cyclists’ deaths varied dramatically. Attorney Jim Reed of the Ziff Law Firm in Elmira, who represents cyclists injured on the road, said the disposition of cases depends on several factors: the aggressiveness of the police investigation and local prosecutors, as well as the existence of aggravating factors, such as drug or alcohol use by the driver. Public outcry also has impact as well. There are more bike commuters downstate. NYC bicyclists are crossing the George Washington Bridge and riding north to Rockland County while more bike commuters are also going to work locally or riding to Metro-North train stations, destined for the city. Bicycle commuting is on the rise nationally, growing by more than 62 percent from 2000 to 2013, according to the League of American Bicyclists. 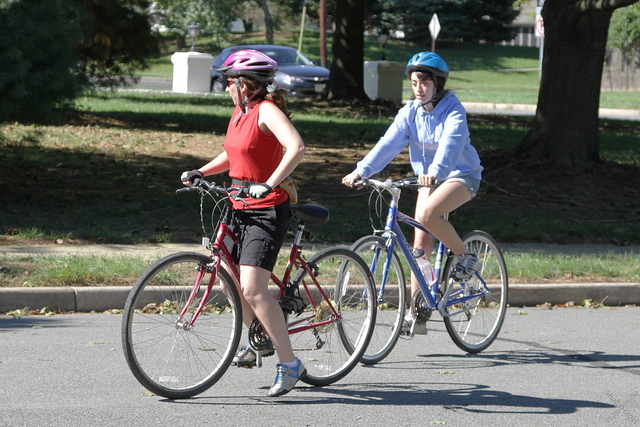 In 2014, according to the state, 47 cyclists were killed statewide and 5,694 were injured. Nationally, 720 bicyclists were killed, up 4 percent from the year before, according to the Insurance Institute for National Highway Safety. Among New York’s 47 fatalities, 11 resulted from drivers failing to grant the right-of-way to cyclists while nine were caused by driver inattention or distraction. Cyclist error was the contributing factor in 19 of the fatalities, according to the state report. In addition, 19 of the fatalities occurred at night – between 9 p.m. and 6 a.m.
Efforts in Albany in 2016 to strengthen New York’s Safe Passing Law, which cycling advocates say will give prosecutors stronger tools to enforce road sharing, failed to come for a vote in the state Assembly. The current law, which was passed in 2010, requires that motorists pass at a safe distance. 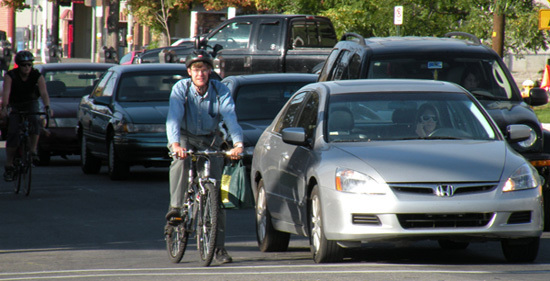 The bill would require that motorists pass cyclists by at least three feet. It passed in the Senate but failed to emerge from the Assembly Transportation Committee, chaired by Assemblyman David Gantt, D-Rochester. A phone message to Gantt’s office was not returned. This entry was posted in Bicycle Accident Cases in Court, Bicycle accident lawsuits, Bicycle Accidents, Bicycle Collisions, Bicycle commuters, Bicycle commuting, Bicycle Laws, Bicycle Safety, Bike accident lawsuits, Bike accidents, Bike collisions, Fatal bicycle accident, League of American Bicyclists, New York Bicycling Coalition, Risks for Bicycle Riders, Uncategorized and tagged accident attorney, accident lawyer, Bicycle, bicycle accident, bicycle accident attorney, bicycle risks, Bicycle Safety, bike accident, Cycling, Elmira, Elmira New York, Injury, James B. Reed, Jim Reed, Law, Lawsuit, New York, New York bicycle accident lawyer, New York City, ny bicycle accident, ny bicycle accident lawyer, ny bicycle cases, pa bicycle accident, pa bicycle accident lawyer, pa bicycle law, Twin Tiers, Ziff Law Firm on July 25, 2016 by Jim Reed. Buffalo Building Better Bike Safety– Hat’s Off to Them! 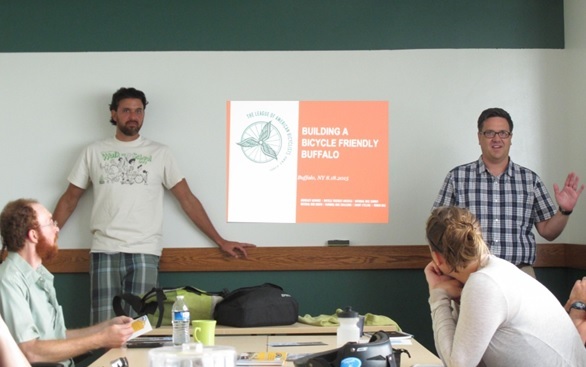 Justin Booth of GO Bike Buffalo, left, and Bill Nester of the League of American Bicyclists talk on Aug. 18. As an Upstate NY cyclist, bike accident lawyer, and a New York Bicycling Coalition Board member, I am wildly enthusiastic about the continuing strides being made in Buffalo and Rochester to promote safer cycling in those Upstate cities! On Aug. 18, GO Bike Buffalo and other bicycling advocates in Western New York met with Bill Nester, Vice President of Programming with the League of American Bicyclists. There is a great story about the meeting on the New York Bicycling Coalitiion website. Nester was in Buffalo to talk about why it’s important for Buffalo and other communities to be part of the League’s Bicycle Friendly Communities program. So why become a BFC? From the NYBC story: By taking key steps to become a Bicycle Friendly Community, like adding and improving bike infrastructure such as protected bike lanes and trails, the BFC program benefits not only residents of your city but it also helps to attract people from other states and nations. Multiuse paths, rail trails, protected bike parking, great events like Buffalo’s Skyride and much more, are all BFC developments and activities that make people feel comfortable while biking in your town and region. The meeting attracted local political leaders and the news media. Rochester is also on the road to making its city more bicycle-friendly by working to make its Inner Loop safer for riders. I blogged about that project here. The Rochester Cycling Alliance, the city’s bicycling advocacy group that is helping with the Inner Loop project, will host a 2016 meeting about the League’s Bicycling Friendly Communities. No date has been set yet, but I will publicize it here and I hope Twin Tiers residents will attend the meeting and begin advocating for similar status in Elmira, Corning and Ithaca. Better bike safety is good for everyone! This entry was posted in Bicycle Safety, Cool Stuff for Bicyclists, League of American Bicyclists, New York Bicycling Coalition, Uncategorized and tagged accident attorney, accident lawyer, Bicycle, bicycle accident, bicycle accident attorney, bicycle risks, Bicycle Safety, bike accident, Buffalo, Cycling, Elmira, Elmira New York, James B. Reed, Jim James B. Reed, Jim Reed, New York, New York bicycle accident lawyer, ny bicycle accident, ny bicycle cases, pa bicycle accident, pa bicycle accident lawyer, pa bicycle law, Twin Tiers, Upstate New York, Ziff Law Firm on August 24, 2015 by Jim Reed. The League of American Bicyclists lists NY No. 42 in its national ranking of Bicycle Friendly States for 2012. 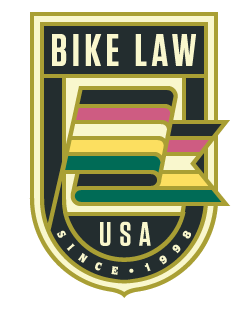 The League of American Bicyclists, in honor of National Bike Month in May, recently released its latest Bicycle Friendly State Program rankings, and New York was a dismal No. 42 in the national ratings, the League’s fifth annual assessment. As a new Board Member of the NY Bicycling Coalition (NYBC), a statewide bicycle advocacy group, I was disappointed to see that NY was rated so poorly. There is lots of room for improvement in making NY a safer and more hospitable environment for cyclists. The good news is that certain cities (i.e., Rochester) are making great strides forward in designing and implementing cycling infrastructure. The bad news is there’s lots of work ahead of us but it is my hope that groups like the NYBC and their many devoted volunteers will continue to make incremental improvements in making the Empire State cycling friendly. According to a news release from Brian Kehoe, the NYBC Executive Director, the state’s ranking was based on many points, including infrastructure and funding that provide on-the-ground bicycle facilities; education and encourage programs that promote cycling; and passage and enforcement of bicycle-friendly laws that make it safe and comfortable for people of all ages to ride. New York’s recently enacted Complete Streets Law was noted as a positive achievement, according to the news release. 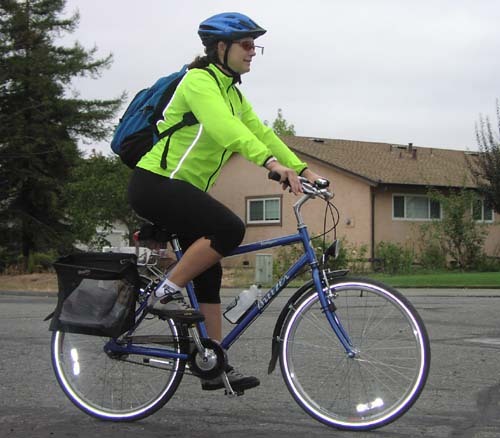 Tips for improvement included adoption of a state bicycle plan and the establishment of a statewide bicycle advisory commit­tee to oversee its implementation. To learn more about the national rankings, click here. To see the report card on NY, click here. 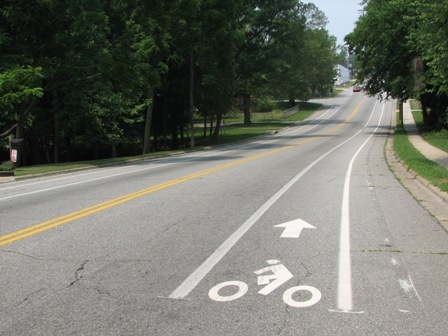 Read all about the bicycling renaissance in Rochester by clicking here! Washington state was No. 1 in the national rankings, followed by Minnesota and Massachusetts. Nebraska, Kentucky, New Mexico, Montana, Alabama, West Virginia, North Dakota and Arkansas ranked lower than NY. RESIDENTS of Elmira, Corning and the Twin Tiers, what can we do to make NY more welcoming and safer for bicyclists? Please share your comments below! Ride safely, and thanks for reading! This entry was posted in Bicycle Laws, Bicycle Safety, League of American Bicyclists, New York Bicycling Coalition, Southern Tier Bicycle League, Uncategorized and tagged accident attorney, accident lawyer, bicycle accident, bicycle accident attorney, Bicycle Safety, Cycling, James B. Reed, Jim Reed, League of American Bicyclists, National Bike Month, New York, New York bicycle accident lawyer, New York Bicycling Coalition, NY Bicycling Coalition, pa bicycle accident, pa bicycle accident lawyer, pa bicycle law, Ziff Law Firm on May 29, 2012 by Jim Reed. Everyone should speak out against new legislation in Washington that eliminates funding to protect bicyclists. The League of American Bicyclists, a great organization in Washington, D.C., that advocates for bicyclists and walkers, is warning this week about a piece of legislation introduced in the House of Representatives that eliminates dedicated funding for bicyclists and walkers and, going even further, removes bicycling from the federal transportation program. If approved, this legislation will GUT laws and programs protecting cyclists and reverse decades of progress. This is VERY BAD for bicylists! The legislation, introduced by Congressman John Mica, R-Fla., is called the American Energy and Infrastructure Jobs Act, and you can read more about it here on the House Transportation and Infrastructure Committee website. Destroying Transportation Enhancements by making it optional. Repealing the Safe Routes to School program, reversing years of progress in creating safe ways for kids to walk and ride bicycles to school. Allowing states to build bridges without safe access for pedestrians and bicycles. Eliminating bicycle and pedestrian coordinators in state DOTs. Now is the time to get involved! On Thursday, two other House members will introduce amendments to restore dedicated funding for Transportation Enhancements and Safe Routes to School. All Americans have a stake in this legislation. We all want safe paths, bike lanes, crosswalks, sidewalks and bikeways. Contact your local House member and urge that legislator to support the amendments! Here are the top 10 reasons to oppose the legislation. You can go here to find your local representative and send them an urgent message. I urge everyone in Elmira, Corning and the Twin Tiers to speak up today! This entry was posted in Bicycle Accident Cases in Court, Bicycle accident lawsuits, Bicycle Accidents, Bicycle Collisions, Bicycle commuters, Bicycle commuting, Bicycle Laws, Bicycle Safety, Bike accident lawsuits, Bike accidents, Bike collisions, League of American Bicyclists, Risks for Bicycle Riders, Uncategorized and tagged accident attorney, accident lawyer, Bicycle, bicycle accident, bicycle accident attorney, bicycle risks, Bicycle Safety, bike accident, Cycling, Elmira New York, James B. Reed, Jim Reed, New York bicycle accident lawyer, ny bicycle cases, pa bicycle accident, pa bicycle accident lawyer, pa bicycle law, Ziff Law Firm on February 3, 2012 by Jim Reed.